Via a narrow slit, part of the beam is selected for measurement. Behind the slit, a detector system is positioned, permitting measurement of beam divergence for the selected bundle. This is accomplished by means of current measurement on the multistrip collector array. Slit and detector system move together with high precision transverse to beam direction, and an intensity profile is measured for each selected position. detector assembly inside an emittance measurement chamber (2 x). is provided for integration into beam transport system. 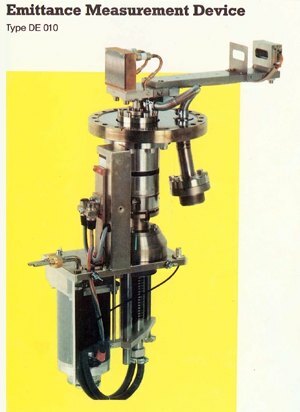 Slit and detector assembly (2 x). Signal-processing system, including an appropriate interface for computer control.